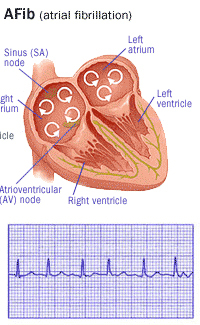 Atrial fibrillation is an abnormal rhythm of the heart. It can be an intermittent (paroxysmal) or chronic condition. In atrial fibrillation the upper chambers of the heart (or atria) do not work correctly because of abnormal electrical activity. Blood is not forcefully moved out of these chambers and becomes ‘static’, which allows blood clots to form and can put patients at risk of stroke. Some people have no symptoms of atrial fibrillation while others experience marked shortness of breath. Risk of stroke is a serious complication associated with atrial fibrillation. A stroke can occur if a blood clot forms in the left atrium because of sluggish blood flow and a piece of the clot (called an embolus) breaks off. 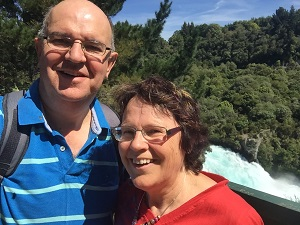 Without preventive treatment (eg, blood thinners), stroke occurs in approximately 1.3 percent of people with AF who are 50 to 59 years each year and increases gradually to 5 percent each year for people 80 to 89 years.